With an ergonomic design and soft-grip handle that fits in the palm of your hand for a firm grip, this electric wine bottle opener from Oster is easy to hold and operate. When it’s not on the charging base (which is included), the device can open about 30 bottles of wine on a single charge. According to the description, a full charge takes about six to eight hours to complete. There’s also a foil cutter that comes with it. And for those of you who like colorful products, this one is available in three different finishes: silver, merlot, or champagne. A top seller in its category, this electric wine opener is beloved by many. Some have said it’s lasted for years, although some have also reported it breaking over time. But those who love it say it works great and gets the job done well. If you’re looking for a durable product that is sleek and eye-catching, this is a great choice. Not only is this electric wine bottle opener pretty, but it’s also top-notch quality according to reviewers. Housed in stainless steel with a transparent shell surrounding the corkscrew mechanism, it’s a tough and durable product (about two pounds). There’s a built-in rechargeable battery that allows the device to open up to 30 bottles on a single charge. 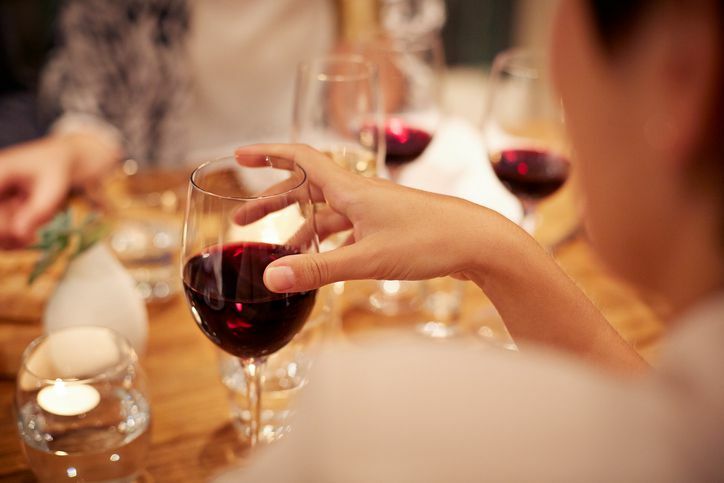 With a simple push of a button, the cork will be removed from the bottle in seconds. This opener also comes with a foil cutter to remove seals easily. Customers love how well the product works and how simple it is to use. The LED light is something a lot of them have raved about too. It stays lit when it’s on the charger, so some have used it as a kitchen night light (bonus feature!) In terms of negative reviews, there have been reports of the product malfunctioning or breaking which has left some customers disappointed, but the majority of those who have purchased this product love it and would recommend it to others. Want to take a look at some other options? See our guide to the best wine openers that you can buy today. 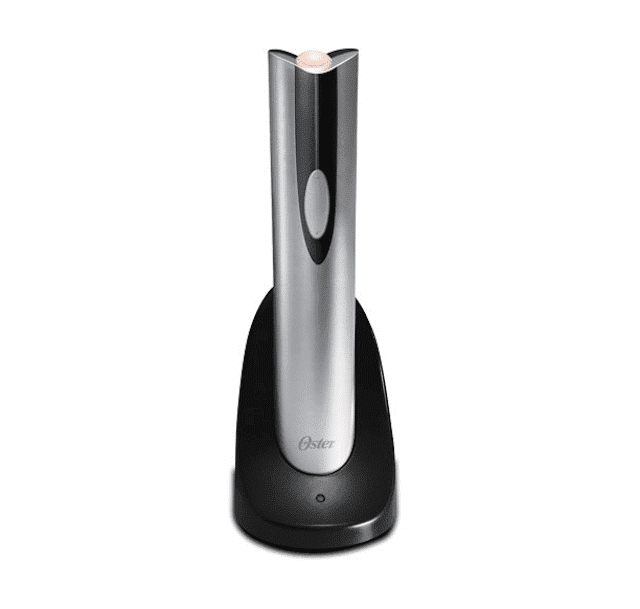 If you like the idea of an electric wine bottle opener, but don’t want to spend a lot of money on one, this product from Oster is a really good choice. It’s a basic electronic opener that will open a bottle of wine with a touch of a button, but it also comes with a recharging base and foil cutter. Plus, since it’s designed with a metallic tuxedo black and brushed gunmetal finish, it’ll look sleek on top of your kitchen counter. Many customers have found this to be a handy device that’s easy to use and is a good value. Just a warning, though: some have had issues with the cork getting stuck inside it. If you’re okay with an occasional malfunction (which according to reviewers is usually an easy fix), then perhaps this budget pick is right for you. Corkscrews, depending on their size and features, can be another budget-friendly option. Check out our guide to the best corkscrews to find the right one. Some customers who have trouble opening up wine bottles praised this device saying how much easier it makes the process. Most customers were happy with the overall performance, with many saying it’s lasted for years. Those who left critical reviews had issues with it not working or breaking over time, but most were happy with the product. Most electric wine bottle openers come with a charging stand and foil cutter, but if you’re looking for something with a few more bells and whistles, here’s a fun set that features a vacuum pump, two stoppers, and an aerating pourer. So, you’re not only getting a basic opener but a device that preserves the wine too! Because of the extra features, this product is a little more pricey than its counterparts but it’s worth it if you are looking for something that can keep open bottles fresh for another day or two. In addition to the extras, the product is sleek and durable. According to the description, the whole thing takes up about six inches of counter space, so it’s not too bulky considering how much it does. Because it includes other wine tools, it makes a nice gift for a friend or family member. Most of the customers who have purchased this electric wine bottle opener have had no complaints with it, although a couple did report that it stopped working over time. You’ll find that most electric wine bottle openers are black and/or silver, but this metallic red one from Oster adds a fun pop of color to your kitchen. The pretty hue, paired with the product's sleek and simple style, make it our pick for best design. Of course, the functionality is there, too. Easy to use, it opens up to 30 wine bottles on one charge with a simple switch. When not in use, you can place it on the compact recharging base. It also comes with a foil cutter. Many reviewers love the aesthetic of the opener, saying it’s stylish and that the color is great too. Most said it was simple to operate and were happy with its performance overall. Some reported having issues with the cork getting stuck but were ultimately able to get it out. Many also said they gave it to someone as a gift, so if you’re looking for a present for a wine-lover, this is a great choice.